If you are in leadership and you feel you need balance restored in your life, this wellness retreat is for you. When you as a leader are drained, you also lack the capacity to give out to others. This can start a spiral, often leading to personal relational problems and even burnout. This is an opportunity to allow God to refresh, restore and rejuvenate you with renewed energy, vision and hope. -The Retreat had a great impact on our marriage, but my whole life, work, and ministry was impacted. -I felt like a 1000 pieces of a puzzle when I arrived but now I know how to put the puzzle together. -It is life changing – giving you the “HOW TO”, the tools to change your life forever. -I found that the Retreat was well planned, well organised and had excellent time management. It brought about a realisation of how important it is to live a healthy lifestyle. -The venue was so restful and restorative, the meals were excellent and the program was life-changing. -We highly recommend that every leader attends this one week seminar that will change your life, enrich your marriage and transform your leadership and ministry. Arrive Monday from 2pm – depart Friday 10am. •Balancing your spiritual, emotional, mental and physical life. •Information regarding your nutritional choices and its impact on your physical and emotional wellbeing. •Helping you to clarify and define your life “mission”. •Finding Emotional Wellness in a stressful world – how to deal with the losses we face on a daily basis. • For those in leadership roles only. Space limited. • Breakfast, lunch and dinner all inclusive. • Plenty of time for rest and recreation. There will be a daily light exercise program and personal time to have fun, rest & be restored. • Input into healthy eating. 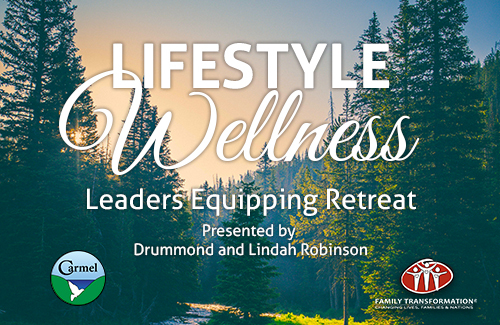 Join Drummond and Lindah Robinson for a Retreat designed for people in leadership portfolios and allow God to refresh you in your life, marriage, family and calling. Accommodation: Room rates vary from R3520 – R5840 per two people sharing for the week, inclusive of all meals. To book your room reservation, contact Carmel at 044 889 0019 or email reservations@carmelguestfarm.co.za and cc info@carmelguestfarm.co.za – Specify Lifestyle Wellness Retreat. A deposit of R1000 is required to book your room. Subsidies are available. If you would like to attend and finance is a challenge, please contact Carol at Family Transformation to enquire about this. Drummond and Lindah are Founders and Directors of Family Transformation International and have been involved in family ministry and church leadership since 1984. Drummond also has a wealth of business experience after managing his own company for 21 years prior to entering into ministry. They have a passion for healthy, Godly marriages and families and have helped many people in various nations come to personal wholeness and their God-given purpose and destiny. They are the authors of several books on marriage, personal wholeness and Kingdom wellness. Many of their resources have been distributed internationally establishing and equipping leaders. They served on the pastoral team at Harvest Christian Church Port Elizabeth, founding and leading the Family Centre for 21 years, and multiplying this vision into other communities. They have recently launched the “Kingdom Wellness Program” to help people, especially leaders, to live balanced, fruitful and fulfilled lives. Carmel is often described as “a little bit of heaven on earth” where God’s presence is tangible. Whether through God’s creation, fellowship or some of the teachings, you are bound to leave here refreshed & restored. As always, Carmel offers a unique experience of Christian fellowship and teaching, a warm sense of family, and delicious food plus the opportunity to get away from it all in one of the most beautiful coastal settings to be found. Our newly introduced programs vary from light hearted family fun during our holiday times to more academic, reflective & edifying programs depending on the subject. Seize the opportunity to come to Carmel and experience teaching from some of the most renowned speakers and experts in their fields!